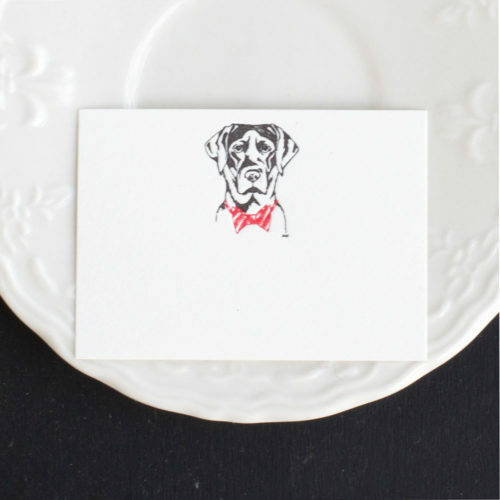 Our festive, letterpress, black lab place cards set the tone for the table or your special event. From the bachelor party to a Holiday party, or any fulfilled event. So many occasions to celebrate. Hint: These make beautiful Gift Enclosures and Calling Cards, too. 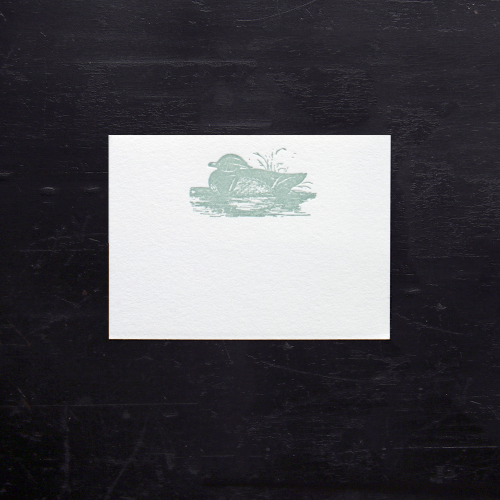 A crisp pineapple, now in a letterpress place card. Make each guest feel welcome. 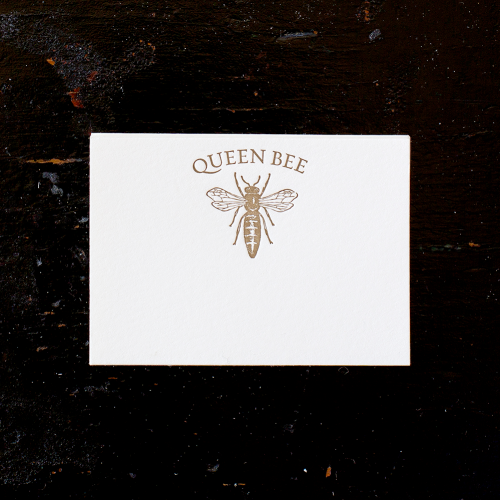 Printed in Early Gold ink on 100% cotton, 110# pearl white card stock. Commissioned artwork for Ancesserie. Hint: perfect for gift enclosures, also. Our pink little piggy, now in a letterpress place card. Set the tone for the table or your special event. Printed in blush pink ink on 100% cotton, 110# pearl white card stock. Hint: perfect for gift enclosures, also. Hint: these make great gift enclosures and tiny notes, too. 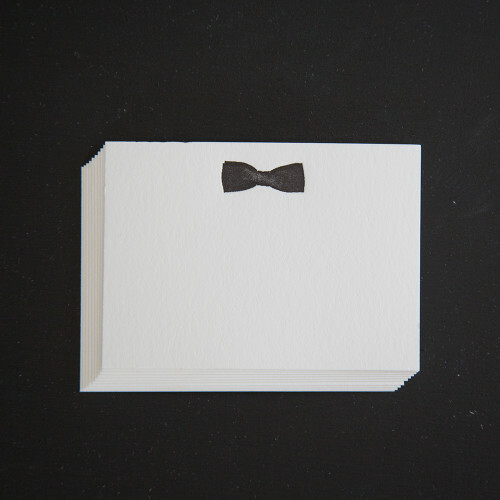 Our elegant, letterpress, black tie place cards set the tone for the table or your special event. From the rehearsal dinner to the bachelor party, a party just for him, or an elegant and refined dinner celebration. So many occasions to celebrate. 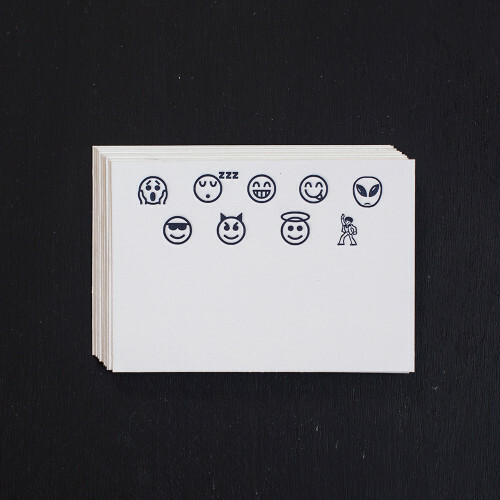 Have fun with our new emoji, letterpress place cards. 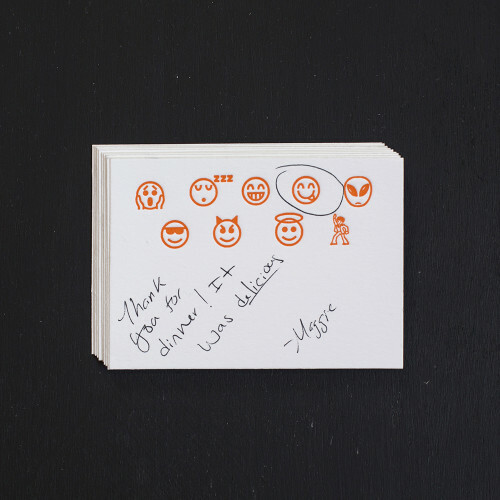 Simply circle or mark which emoji best represents your guest, then write their name beneath. Great conversation starter for your party. Letterpress printed in either creamsicle or night blue. 10 flat, small cards. Luxurious, 100% cotton, 110 lb card stock in Pearl White. 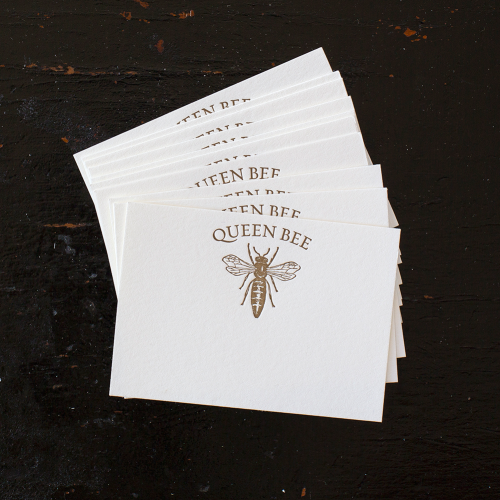 Our lovely, letterpress Bee and Queen Bee petite cards set the tone for the table or your special event. Have fun setting your tables or tagging your gifts……who will be the queen bees, who will be the worker bees and the honey bees?? These make beautiful calling cards and enclosures, too. Perfect for a Garden Party or Shower. Who is the Queen Bee, or is everyone a Queen Bee? The finishing touch for the table or perfect enclosure for your gift. 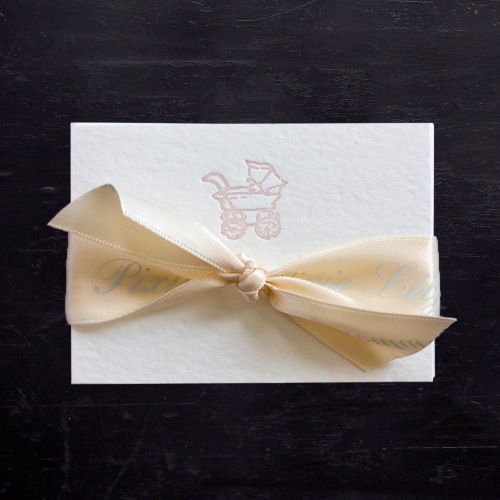 Our lovely, letterpress, petite cards set the tone or theme for your special occasion. Choose between our 25 designs. 10 Cards per pkg. $16 Hint:These make beautiful Calling Cards, too. 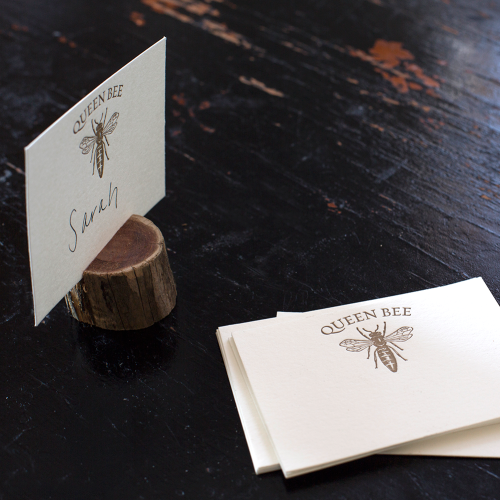 Pair with our Worker Bee Place Cards for a fun table setting. Boxed Set of 4 Cedar Card Holders. For your dinner table, special event, recipes, menus and more. Hand selected timbers from South Carolina. Wood is aged, dried and will last a lifetime. Card holders are individually cut and finished by local woodworker. No two are alike! 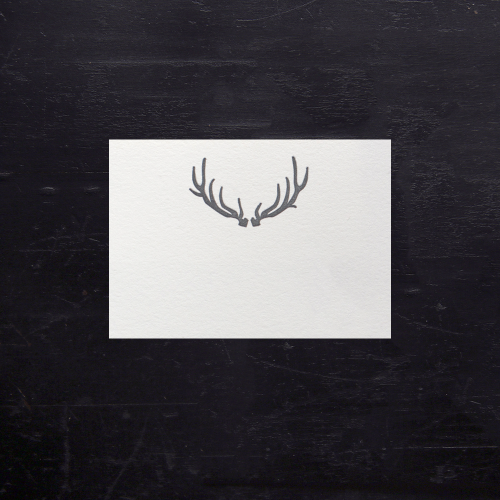 Our lovely, letterpress antler place cards set the tone for the table or your special event. Choose from London Fog Gray or Blush Pink. Our lovely, hand calligraphy place cards are the finishing touch for the table. Calligraphic, flourishing artwork rendered by our talented, on site calligrapher. A plate is then created from the original artwork. Each card letterpress printed in Onyx Black or Old Gold ink. Our lovely, hand calligraphy custom place cards are the finishing touch for the table. Calligraphic, flourishing artwork rendered custom by our talented, on site calligrapher. A plate is then created from the original artwork. Each card letterpress printed in Onyx Black or Old Gold ink. These make beautiful Gift Enclosures and Calling Cards, too. 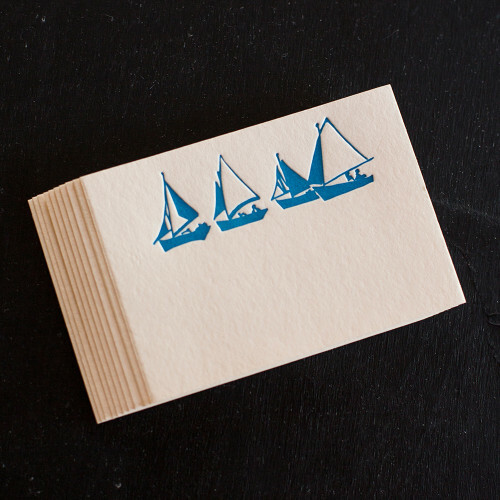 Our lovely, letterpress, Sailboat place cards set the tone for the table or your special event. The perfect hostess gift for the coastal or lake home. 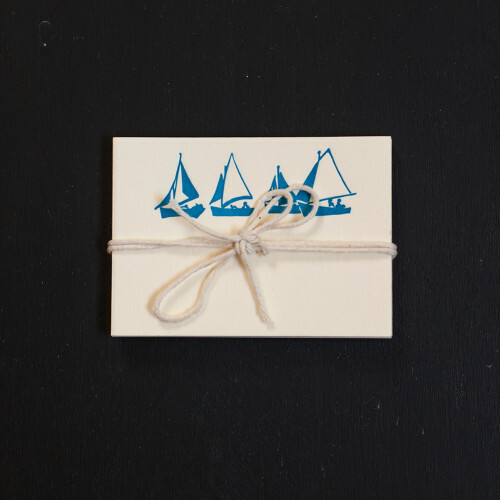 These sailboat cards make beautiful Gift Enclosures and Calling Cards, too. 10 Cards in Marine Blue. The perfect size for a place card or enclosure note. With our Skull & Cross Bones! 10 flat, Small cards Each individually letterpress printed in Hot Pink Ink. Luxurious, 100% cotton, 110 lb card stock in Pearl White. 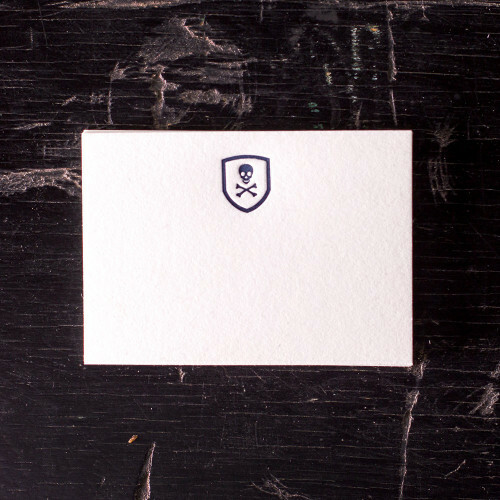 This is the perfect size for a place card or enclosure note, here in our night blue Skull & Cross Bones card theme. Our lovely, letterpress place cards set the tone for the table or your special event. A perfect hostess gift for any home. These make beautiful Gift Enclosure Cards and Calling Cards, too. Hand printed on our most luxurious 100% cotton, 110 lb. card stock. Generous 3 1/2″ x 2 1/2″. Available in a packet of 10 or box of 50. 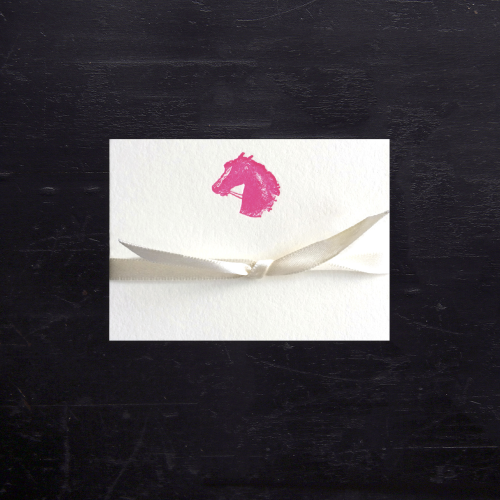 Our Equestrian Horse Head Place Cards are the finishing touch, setting the tone for the table or your special event. 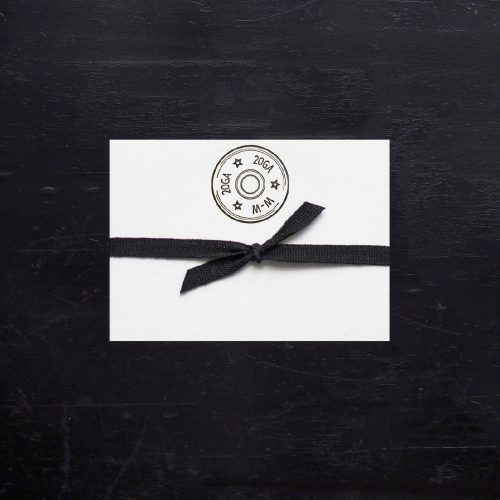 10 Letterpress Cards per package. Set the most elegant and refined dinner table. Our Equestrian Horse Head Place Cards are the finishing touch for your dinner, setting the tone for the table or your special event. Perfect for holiday tablescapes, your dinner party, rehearsal dinner, and wedding. Handmade, elegant, and refined for a discerning table. These make beautiful Gift Enclosures and Calling Cards, too. 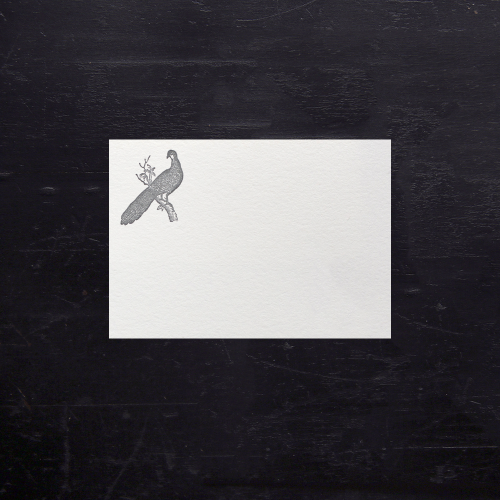 10 Letterpress Cards per package, printed in Onyx Black Ink. 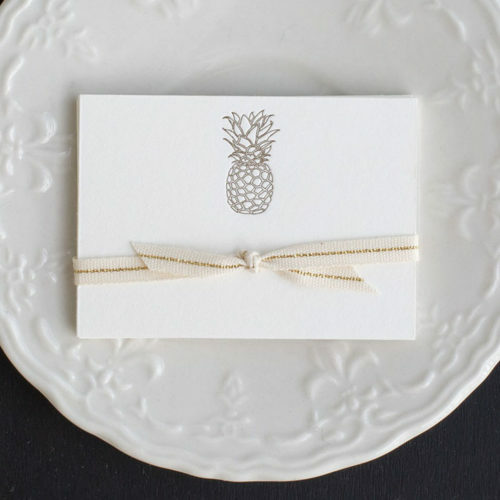 Our new Palm Frond place cards are a favorite! Packet of 10 flat cards, each individually printed on a vintage letterpress in Chartreuse Green ink on 100% cotton, 110 lb., pearl white card stock. 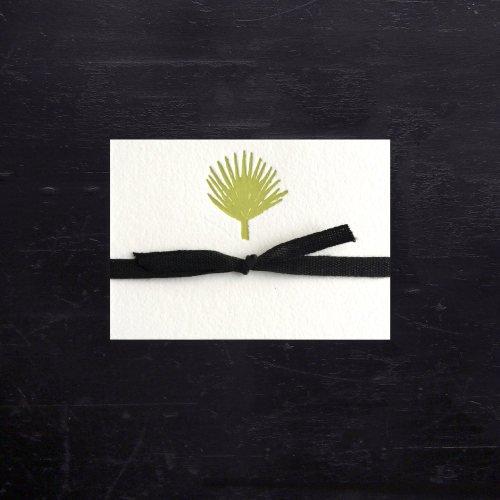 Hint: Pair with our Palm Frond Gift Enclosures, Gft Tags and Note Cards for a special gift or signature for your home. 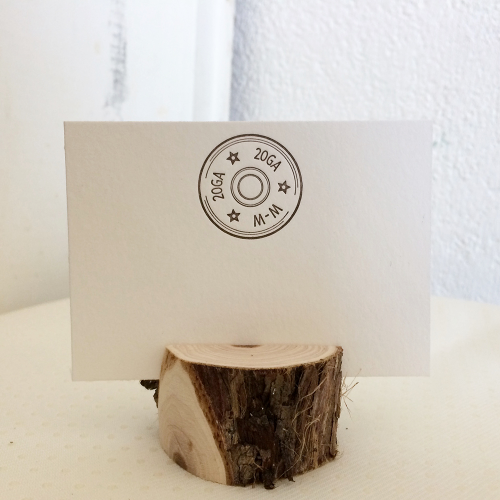 Our handsome letterpress, shot shell place cards set the tone for the table, wedding or your special event. Perfect for a dinner featuring the game of the day. Each card letterpress printed in Autumn Brown ink. Hint: These make beautiful Tags, Gift Enclosures and Calling Cards, too. Available in a packet of 10 or box of 50. 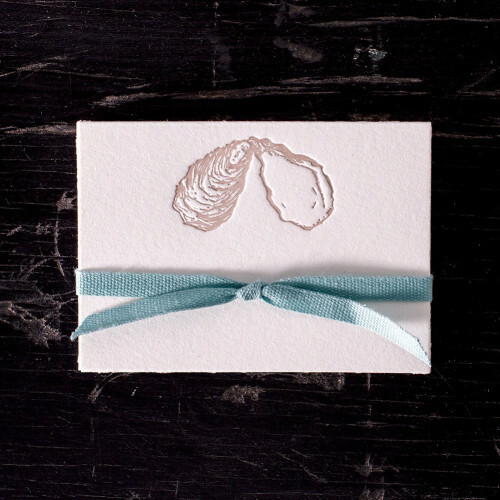 Our lovely, letterpress, oyster place cards set the tone for the table, wedding or your special event. How about an oyster roast? Each card letterpress printed in Biscuit ink . Hint: These make beautiful Tags, Gift Enclosures and Calling Cards, too. The Palmetto Bug place cards….This affluent bug has made its way into stately homes, carriages, cocktail parties and guest bedrooms for centuries. The pesky guest is just begging for attention. Dare you make these place cards a fabulous setting for your event. What fun! Also a unique hostess gift? Fabulous for enclosures, too. Perfect for a Garden Party, dinner party, tropical affair, do you dare? 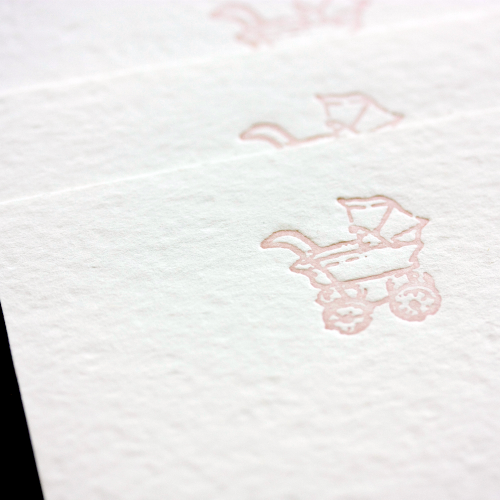 Letterpress printed in Blush Pink ink. Surprise! The finishing touch for the table. 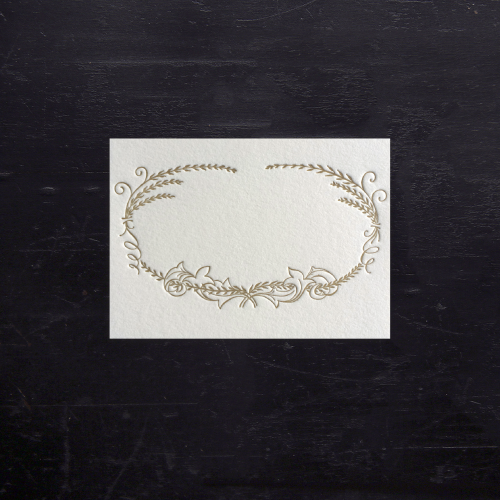 Our lovely, letterpress greenery place cards set the tone for the table and your event. 10 Cards per package. The finishing touch for the table. 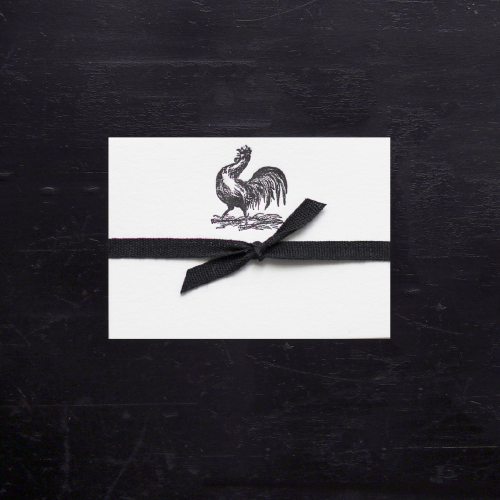 Our fun, rooster, letterpress place cards set the tone for the table and your event. 10 Cards per package. 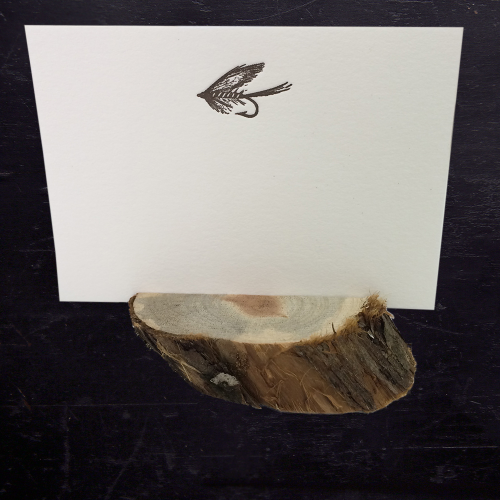 Our lovely, letterpress fishing fly place cards set the tone for the table or your special event. Great for a lake house party or wedding rehearsal dinner setting! 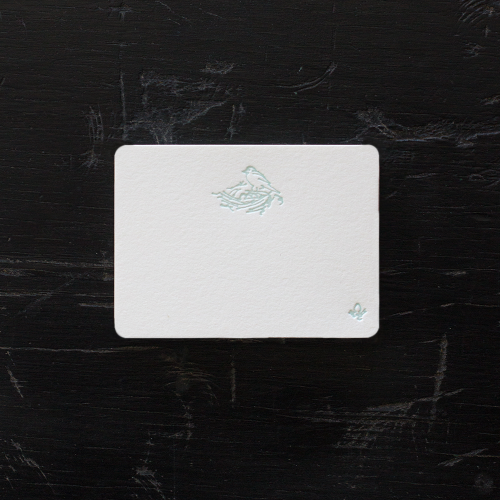 Our kelly green letterpress gentleman place cards set the tone for the table and your event. The finishing touch! 10 Cards per package. These make beautiful calling cards and enclosures, too. Our Wild Duck in Early American Blue ink. lovely, letterpress place cards set the tone for the table or your special event. 10 per package. The finishing touch for the table. 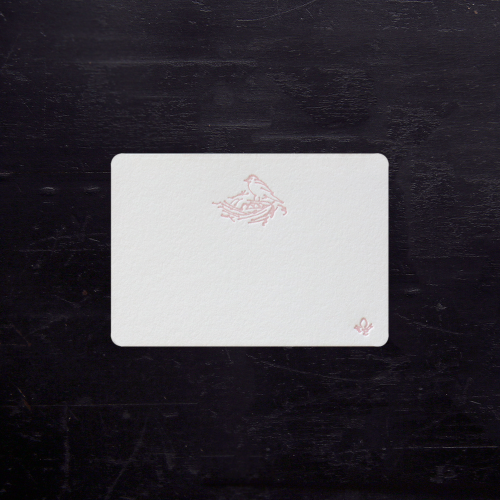 Our lovely, letterpress quail place cards set the tone for the table and your event. 10 Cards per package. Ancesseries hand letterpressed gift enclosures feature Pixie Lily’s vintage carriage logo in pink or blue and come in a pack of 10. Enclosures measure 2 1/2 x 3 1/2 and are presented in a cellophane envelope, tied with Pixie Lily satin ribbon. 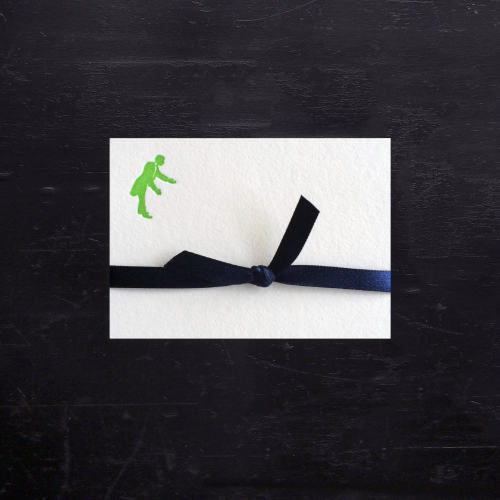 Hint: These also make charming children’s calling cards or place cards for your special event. Ancesserie’s hand letterpressed gift enclosures feature Pixie Lily’s vintage carriage logo in pink or blue and come in a pack of 10. Enclosures measure 2 1/2 x 3 1/2 and are presented in a cellophane envelope, tied with Pixie Lily satin ribbon. Hint: These also make charming childrens’ calling cards or place cards for your special event. The finishing touch for the table. 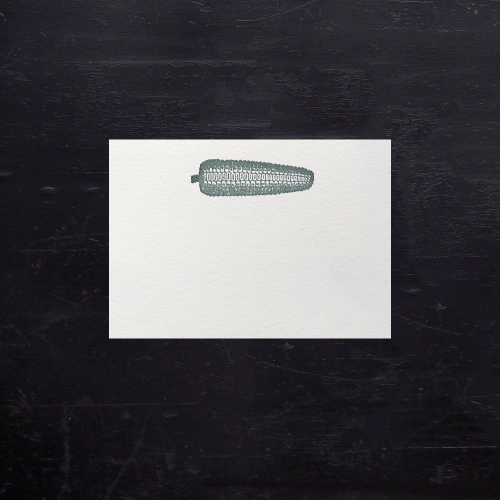 An Ear of Corn in Early American Blue Ink. 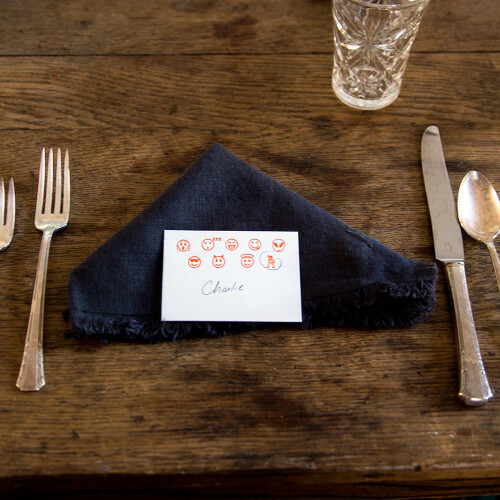 Our lovely, letterpress place cards set the tone for the table and your event. Bar-b-que, picnic, cookout themed party, perhaps? 10 Cards per package. 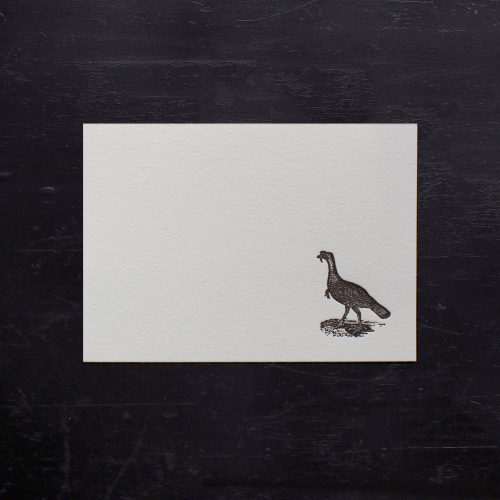 Our lovely,pheasant place cards set the tone for the table or your special event. Letterpress printed in London Fog Gray or Ancestral Olive. New for our Pixie Lily Papier: A sweet bird’s nest letterpress motif in both pink and blue. Hand rounded corners. Rediscover and share the simple beauty of a hand written message with Ancesserie’s line of handmade notes and gift enclosures for Pixie Lily. Each card and enclosure, embellished with a Pixie Lily motif, is crafted using the same style Chandler & Price letterpress that has been in Ancesserie designer Lydia Derrick Wherry’s family since the 19th century. New for our Pixie Lily Papier: A sweet bird’s nest letterpress motif in both pink and blue. Hand rounded corners. Perfect for a little calling cards, note, enclosure or place card. Rediscover and share the simple beauty of a hand written message with Ancesserie’s line of handmade notes and gift enclosures for Pixie Lily. Each card and enclosure, embellished with a Pixie Lily motif, is crafted using the same style Chandler & Price letterpress that has been in Ancesserie designer Lydia Derrick Wherry’s family since the 19th century. 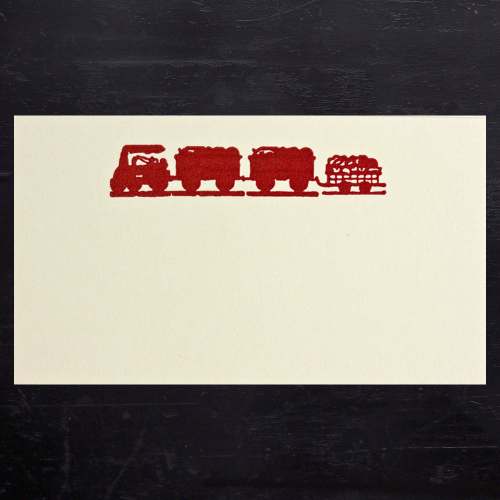 Set of 10 Tiny Choo Choo Cards measuring 2″ x 3 1/2″. 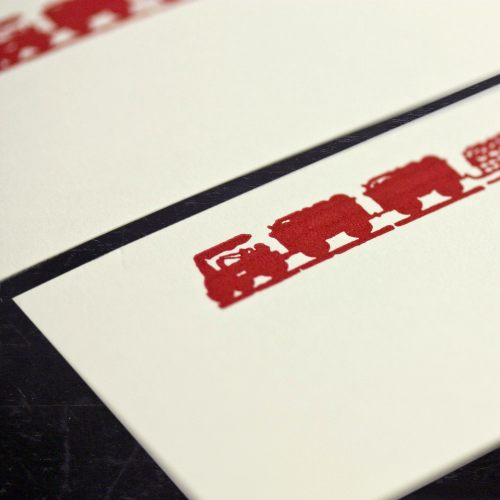 Each printed in cherry red ink on a vintage letterpress with the early image of a little train, once appearing at the top of an 1880’s Train Schedule. Part of The Edgefield Collection. Fun for gift tags, place cards, calling cards and more!